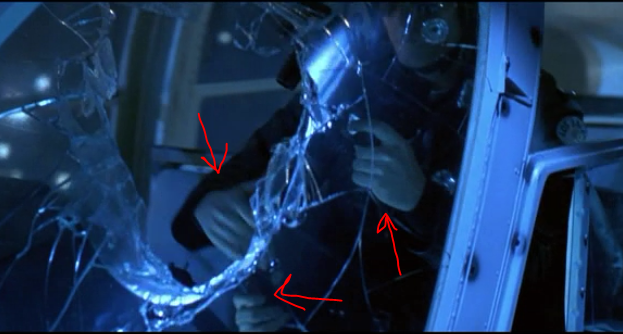 Does the T-1000 use 3 hands in the helicopter chase scene? I recently re-watched Terminator 2: Judgement Day with a friend. When it came to the helicopter chase scene, my friend commented "He's reloading the gun, how is he still flying the helicopter?" Unfortunately it was on TV so we couldn't go back and check, but was the T-1000 using 3 hands in that scene? This is one of my favorite details of the film, it's not explicitly shown in the non-Director's Cut, but there is that moment your friend noticed where it's reloading while flying the helicopter. Actually it has four (4) hands at that moment. To fly the helicopter you have to use both of your hands: one to control the cyclic (the 'joystick', you can see it in the picture) and one to control the collective, the handle on the left side of the pilot, although the collective doesn't need constant attention. If you look closely there are four hands. It looks like the actor was sitting on the lap of the pilot. The pilot's left hand, which is not seen in the screen shot, is to the right, just a few seconds before the shot was taken it is clearly visible. I saw it on the director's cut. If you pause quickly, right after the chopper flies out from under the bridge & look closely at the little sliding window to the right (which is open) you will see the pilots arm resting there. Seems to me though, that there wouldn't be any real need to actually fly a chopper to achieve that shot being that its so up close, but what do I know. Why does the T-1000 move slowly at times? Why doesn't the T-1000 continue to chase after John Connor? Why does the T-1000 react differently to different impacts? Why didn't the T-1000 kill the helicopter pilot? How could the T-1000 use time travel technology?